Victor Haghani, Founder of Elm Partners Management LLC, presents a riveting Master Class that explores his career of fixed income arbitrage trading at Salomon Brothers, giving an inside look into the risky trades they were involved in, how models were not as present as many believe, the process of unwinding positions when the fund crashed and his epiphany to leave the financial industry for some years and return to learn how to invest in a family office form. Unique and insightful comments, a great interview. Hard to believe they are allowed to still trade!!! What a shame!!! excellent insights for people who want to learn. ThanksRaoul and the team. I am not sure why the thumbs up or down. It seems a bit childish to reduce all of these intelligent, successful people to these two poles. Very interesting interview. A great catch for RV. Thanks Raoul and team. Liked the interview. Interesting to hear his perspective on bond trading in the early 1990s, and I don't see the point in casting stones at him - maybe John Meriweather, but not Victor (too jr). in total denial on culpability of LTCM. Could have used less bio and more market insight. Ok, the guy was a (junior) partner at one of the biggest financial collapses 18 years ago, the RealVision audience seem very unforgiving. This was a great, insightful interview, and unique content. This guy seems a little bit in denial on the outcome of LTCM. Fascinating stuff...way above my pay grade but still fascinating! Victor made a small comment regarding experience being part of the game...I guess PHDs can gamble, too, eh? One would hardly realize that we're talking about a period of epic and colossal failures that nearly brought down the entire world financial system. I almost wrote "I'm not guilty of moral hazard," but then realized that I am kinda. Good interview. More of a general comment about RVTV is that it's so much better than any other financial video conten bar none. Truly outstanding. Thank you, Rauol and Grant. Interesting conversation, I can't say I understood anything about the bond trading strategies, but a smart guy. The last 10 mins on his investment concept worth digging into for any retail investors. Very interesting and enjoyable conversation - he seems like a really nice guy too. And as always Raoul really pulled out some interesting tidbits with his line of questioning. Great stuff. Pretty cool to get insights on the LTCM debacle but I don't see why this is a masterclass despite the guy being 'smarter than the rest'. Amazing get, RVTV! Victor's candor and perspective hugely appreciated. Wouldn't mind hearing even MORE about the LTCM trades. Please bring VH back regularly. 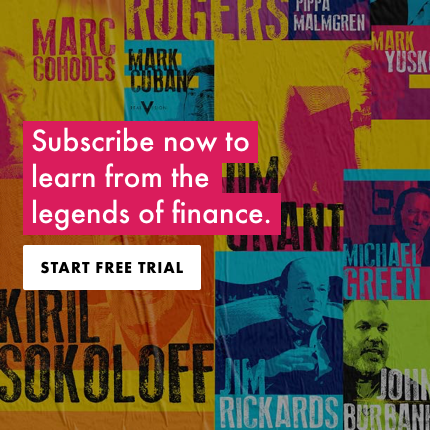 How do Nobel winners leverage 100 to 1 and nearly bring down the fin system? He talks about it in cold detached terms. Apparently he walked away a rich man Sickening. Don't know why he wasn't asked. He seems to be exposing how the little guy is screwed and how pension and mutual funds can't create his moves. WOW!!! I can run a book and beat the stupid crowd. I am so impressed. I need to read When Genius Failed again. Excellent! Really appreciating this very rare insight into LTCM – an insight I can't get anywhere else. Agree but in total denial!!! Too much into the belly of the beast for me.